Black Middens Bastle is a rectangular mid to late 16th century stone two storey defensible farmhouse. The ground floor only had narrow ventilation slits and in the eastern gable wall is the original square headed entrance into the byre but this is now blocked with masonry. There are two later doorways in the south wall, which were inserted when the ground floor was divided by a partition wall. Access to the upper floor was originally by ladder, now replaced by external stone steps and the entrance door was secured by a drawbar. The floor of the living quarters, was of stone slabs supported on heavy timber beams and a small hatchway gave internal access to the byre. In 1583 Black Middens was raided by the Scottish Armstrong family and nearby are the ruins of another bastle and an 18th century farmhouse. The thick walls of roughly squared large stone blocks, laid irregularly, provided first floor living accommodation and ground floor shelter for their livestock. Occupied by middle-rank farmers, clusters of bastles could give support from cross-border reivers. Half a mile west is Waterhead Bastle and 3 miles south is Tarset Castle. 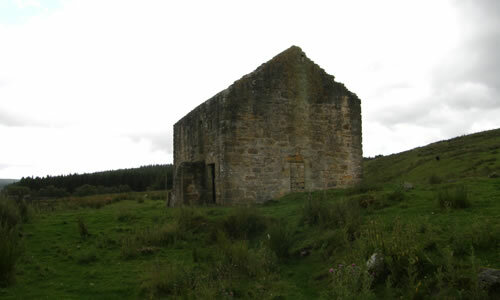 Black Middens Bastle is located on the Reivers Trail, north-west of Gatehouse. 7 miles north-west of Bellingham, off the B6320. The site is owned by English Heritage and is freely accessible in daylight hours. There is a car park, with a map board.